Our Cheltenham tables are simple, solid and practical. Working as both footstools and outdoor side tables, these teak garden tables are wonderfully versatile and are sure to fulfil your purpose. Offering different adjustable height settings, these Cheltenham tables are ideal for resting your legs on but equally suited to holding any items of your choice. 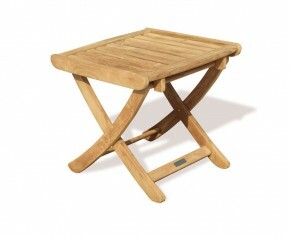 Able to fold flat for easy storage, these teak garden tables are as practical as they are stylish. Made from the finest grade-A teak, there is no need to protect these Cheltenham tables from any weather conditions and they can remain outdoors all year round. With a simple enough design to compliment any other existing furniture, these teak garden tables are an excellent addition to your home. Browse our range of Cheltenham tables here.